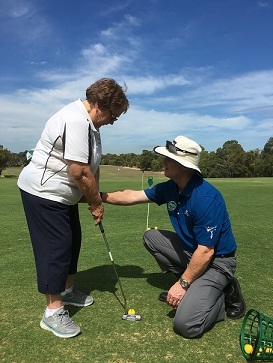 Here at Marangaroo Golf Course we believe that anyone can learn to play golf, if you are interested in learning how to play but are unsure of how to go about it, call us here at Marangaroo golf course on 9247 1733 and let our friendly staff point you in the right direction. We run many different types of classes, on different days and times, so we are sure to find one that suits you. Our head coach Phil Blanchard is available for private lessons, group classes and junior classes. We also have Bronte Colbert, Glen Irwin, Zac Adenan and Rob Farley available for bookings. Individual lessons (one on one) are available 7 days a week, all year round, with over 5 qualified PGA coaches with thousands of hours of coaching experience behind them, whether you are looking to learn to play or are just stuck on one particular part of your game, we are sure we can make a difference. Our coaches will understand your game and be able to help you. Here at Marangaroo we have a great Junior programme that runs during school terms as well as school holidays. During the school term we run a 7 week programme which are held in 4 different classes, on different days and times. This makes it easier for parents to find a suitable time for their child to attend one of our classes. As an alternative we also offer the school holiday classes. We have a 2 day programme consisting of 2 hours on each day that we usually hold on the first and second week of the holidays. For any further information or for bookings please contact us on 9247 1733.